As they age, arthritis in dogs is common, they suffer from the same ailments that old people do: Stiffness of the joints, lack of energy, hearing and eyesight become less acute. Dog incontinence may also be a problem. Fortunately a dog's sense of smell seems to be most resistant to aging changes. There are many products in today's world to make your aging dog more comfortable. A warm comfortable bed in something an old dog appreciates. Orthopedic dog beds are a good choice, they provide maximum support and are specifically made to cushion joints and bones. This is perfect for arthritic dogs and they are available in various styles. For added comfort consider a heated dog bed, bed warmer or a heated blanket for your aging canine friend. The combination of a supportive bed and heat will have a very therapeutic affect on your dog. Place the bed in an area free of drafts. Older dogs tend to put on extra pounds because of reduced activity and they burn calories less efficiently. Therefore; choose food for an elderly dog carefully. They do best on fewer calories because they use less energy. But do not reduce the amount of food for your aging dog; just choose lower-calorie foods. Ask your veterinarian for recommendations on diet and a vitamin/mineral regimen based on your dog's health. It may make a difference to his energy level. Be sure your senior dog has plenty of water at all times. Older dogs can become dehydrated more easily then younger ones. Exercise is necessary but be careful not to over tax your best buddy. Let him smell the flowers or the "fire hydrant." Short walks several times a day, rather than one long one may be a better idea. Routine checkups for older dogs are important. In addition to annual vaccinations and health checkups, pay special attention to dental care. He is likely to lose some teeth and may develop bad breath. Keep his teeth clean and free of plaque build up and have his teeth routinely checked. decreasing the chance that he will develop serious problems, such as heart disease resulting from tooth decay or gum disease. Incontinence is sometimes a problem for aging dogs. There are many causes for this. Do not punish him for something that is not his fault. See your veterinarian, it may be treatable. To keep your home clean, a temporary way of dealing with uncontrolled urination is the use of dog diapers and wee wee pads. Doggy diapers are available in several sizes and styles designed for male and female dogs. Training pads may be placed under your dog to protect the carpet, furniture and his bed. Good grooming for your senior dog is useful. Brush daily to keep the coat healthy and to discover any problems such as dry skin, sore spots, body odor, fleas and ticks. Check your dog's ears for odor or discharge produced by infection. Genetics do play a part. Generally speaking; small dogs (20 lbs) live longer and don't show signs of aging until around 12 years of age. While with medium sized dogs (20 - 50 lbs), the affects of aging will be seen around 10 years. 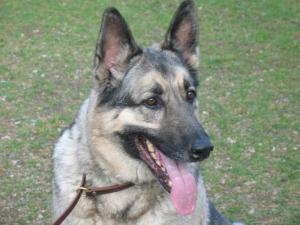 For larger breeds (90 lbs and up) aging generally begins to show around 8 years of age. There are exceptions to this, of course. With advances in geriatric veterinary care, good nutrition and excellent care for aging dogs, the process of aging may be slowed down. Donna Boras is the webmaster of www.dog-beds-n-beyond.com and a life long dog lover. See more information on orthopedic dog beds,heated dog beds, information and advice on caring for your dog and product reviews.